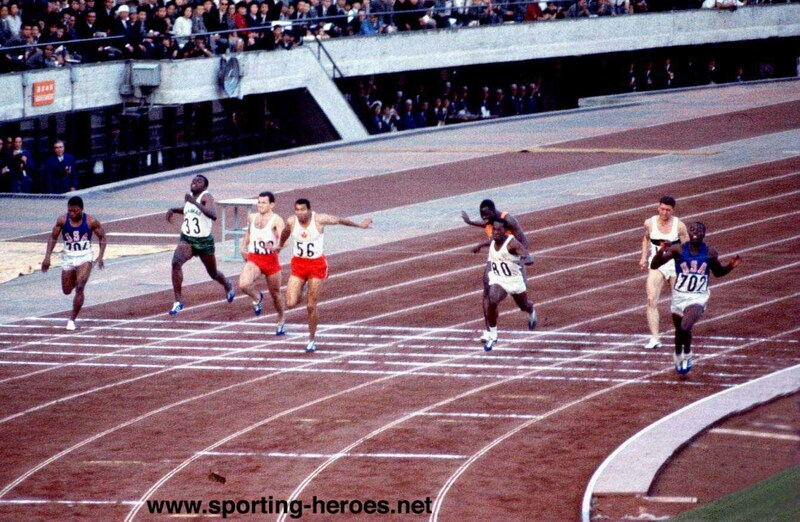 Mel Pender in outermost lane, and Bob Hayes in innermost lane at the 100-meter finals of the 1964 Tokyo Olympics. American sprinter, Trent Jackson, easily won his 100-meter heat at the 1964 Tokyo Olympics. Mel Pender qualified with ease. Jackson won his quarter0final heat as well, while Pender tied for first in his, and thus they both made the top 16, and joined favorite, Bob Hayes, in the semi-final heats. For some reason, Jackson had his worst time, and did not come close to making the final 8. Pender finished fourth in his semi-final heat, barely qualifying for the finals. And he looked ugly in the process, tumbling to the cinder track in pain. Bob Hayes noted in his autobiography, Run, Bullet, Run, that Pender was carted off on a stretcher. So Pender ran. Stationed in the outside lane, Pender shot out of the blocks. But all attention quickly shifted to the innermost lanes where Bob Hayes and Enrique Figuerola were pulling away. Of course, as you can see in this video, Hayes continues to pull away to win the gold, tying the world and Olympic records of 10 seconds flat. Pender finished in sixth. According to a October 20, 1964 article in the US Military newspaper, Stars and Stripes, the Army sergeant was devastated. I promised my wife and daughter I’d bring them home a gold medal. If there would have been more time between the semi-finals and the finals of the 100, I think I could have won it. In the last run I just couldn’t get that little kick. I was in front of Jerome (Harry Jerome of Canada) and Figuerola (Enrique Figuerola, Cuba) at about 70 meters mark when the pain got so bad that I lost stride and didn’t know if I could make it to the finish line. Posted in Japan, Tokyo 1964, Track and FIeld and tagged 1964 Tokyo Olympics, Bob Hayes, Enrique Figuerola, Expression of Hope, Harry Jerome, Mel Pender, Run Bullet Run, stars and Stripes, Trent Jackson. Bookmark the permalink.